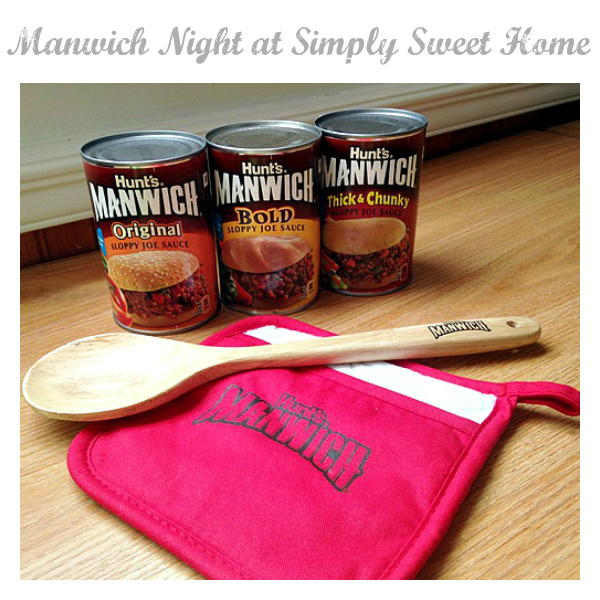 I love Manwich Night! It’s definitely one of my favorite Easy Weeknight Meals. 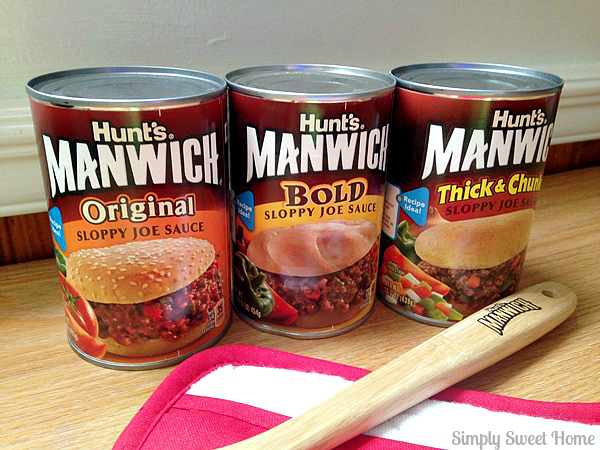 I grew up eating the Original Manwich, but I recently became familiar with the other varieties: Thick & Chunky and Bold. If you’ve seen these in your local store, and have been curious, I’d definitely tell you they are worth a try. If you love the red and green peppers in Original Manwich, then you will definitely love the Thick & Chunky version. And if want something with no peppers (perhaps something for a picky child), then you’ll want to try the Bold. I actually thought the Bold would be more spicy, but it’s really got more of what I’d call a “tangy” taste to it. But whatever it is, it is super yummy! How do you like Manwich? When I was growing up, no Manwich was complete without a nice slice of cheese! And recently I’ve tried adding mayo and pickles, along with the cheese. It makes for a sandwich that can’t be beat! And it’s great with any variety of Manwich Sauce. 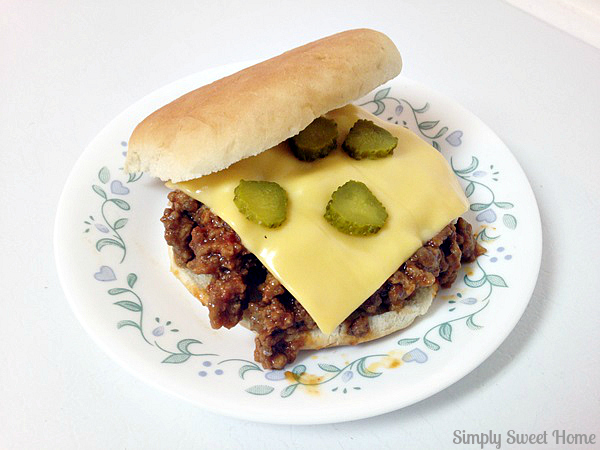 My husband has also introduced me to Manwich Pie (Manwich over corn chips), and after doing a little research, I’ve found a ton of great Manwich Recipes. One recipe I definitely plan on trying is the Saucy Meatloaf featuring Manwich. And I also found Sloppy Joe Meatballs! Yum! Directions: Brown ground beef and add in Manwich sauce as directed. Spead meat & sauce evenly over hard or soft tortilla shells. Top with cheese, lettuce, and sour cream. Enjoy! The summer will soon be drawing to a close, but it’s not too late to get in to some summer recipes for those of end of summer and Labor Day barbecues. 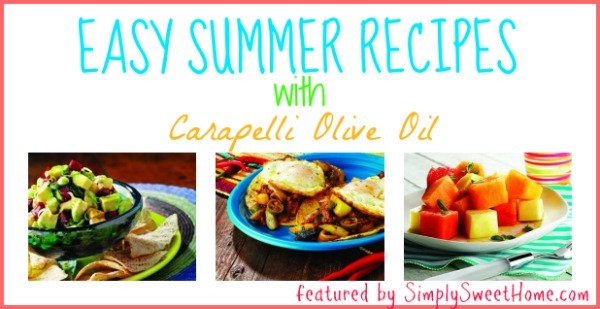 Recently I received a sample of Carapelli Olive Oil, and they also sent me some great recipes for the summer time, which I’m happy to share with you today.